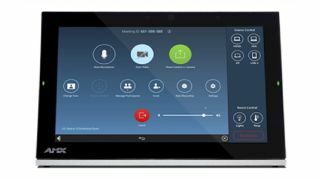 Harman Professional Solutions has announced an alliance and product offering with Zoom Video Communications, that aims to transform standard meeting spaces into powerful collaboration centers. Available immediately, two new solutions integrate the AMX Acendo Core Collaboration System and the Zoom Meetings service as well as AMX Modero G5 Control Panels and the Zoom Rooms Controller app to give users the freedom to make meetings more productive and efficient. The AMX Acendo Core Collaboration System is ready to support and natively run the cloud-based Zoom Meetings application to launch one-touch Zoom Meetings. Zoom Meetings offer users simplified, streamlined video communications and messaging, including the ability to record meetings locally or to the cloud, as well as many additional features to deliver a more interactive meeting experience. The AMX Acendo Core platform also features wireless document sharing, web browsing, room scheduling, and more. AMX Modero G5 Control Panels also immediately support the cloud-based, Zoom Rooms controller application to expand Modero G5-controlled standard rooms into complete, fully ready-to-collaborate, meeting spaces. The AMX and Zoom collaboration offers users the ability to simultaneously and seamlessly run the Zoom Rooms app alongside touch-based room control applications and other onscreen functions such as powering on/off lights and displays, opening and closing shades, and controlling the environment.